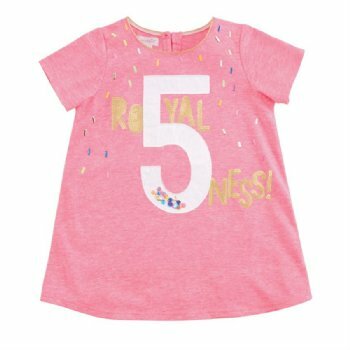 Neon Sprinkle Royal 5-ness Birthday Tunic. Short sleeve cotton slub tunic features neon sprinkle beading, gold lurex neckline piping and sequined and jersey applied age sentiment. Jersey number applique has white mesh overlay with loose multi-color sequin filling.